January 15, 2010 - WICHITA, Kan. Hawker Beechcraft Corporation (HBC) announced it has received Federal Aviation Administration (FAA) and European Aviation Safety Agency (EASA) Type Certifications for the new Beechcraft King Air 350i turboprop. The King Air 350i sets the standard in cabin luxury, entertainment and flexibility while delivering unmatched fuel efficiency and the lowest operating cost per seat, making it one of the greenest aircraft available to business travelers today. Deliveries of the aircraft commenced in December 2009. The King Air 350i is the first business aircraft on the market equipped with the new Rockwell Collins Venue cabin management system (CMS). The system supports multiple Personal Entertainment Devices, including CD, DVD, Blu-ray Disc™ and MP3 players, Apple iPods, Sony PlayStation and Microsoft Xbox 360 gaming consoles, laptop computers, digital and video cameras, USB data-storage devices and future HDMI devices. The new CMS features a 15.3-inch swing-out monitor in the forward entertainment cabinet with wide-screen display showing digital high-definition video and entertainment. High-definition screens at each seat can be added. Nine programmable switch panels control the CD, DVD, Blu-ray Disc and MP3 players, audio and video jukebox, 3-D Airshow moving map and flight information. Cabinets are also equipped with standard USB charging ports and docking stations for travelers’ wireless devices. In addition to the CMS enhancements, the King Air’s trademark flexibility has been stretched even further through the 350i’s new state-of-the-art Beechcraft FlexCabin capability, which enables owners to reconfigure or remove aft club components to meet the specific needs of each mission. The sleek interior design of the King Air 350i spotlights the unparalleled cabin capabilities. The updated interior includes all-new headliner, seat tailoring and tables, electrochromic window darkeners, LED lighting, increased legroom and optional seat warmers. Additionally, the King Air 350i includes an optional vanity in the aft lavatory area that incorporates a variety of toiletry storage areas, running water, automatic LED lighting and dual mirrors, and is located next to the King Air 350i’s in-flight accessible baggage area for total passenger privacy and convenience. 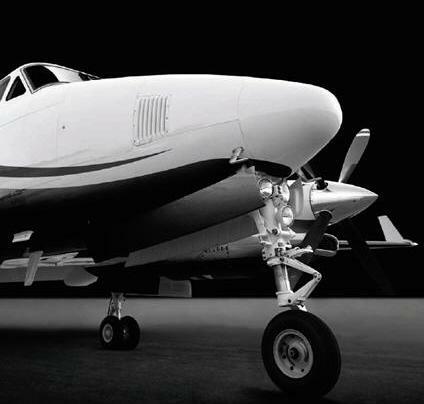 The King Air 350i is also now the quietest King Air. Cabin sound levels have been reduced to an average of 78 dBA, equal to or better than competitive business jets. Deliveries of the next generation aircraft have commenced. Hawker Beechcraft Corporation is a world-leading manufacturer of business, special mission and trainer aircraft – designing, marketing and supporting aviation products and services for businesses, governments and individuals worldwide. The company’s headquarters and major facilities are located in Wichita, Kan., with operations in Salina, Kan.; Little Rock, Ark. ; Chester, England, U.K.; and Chihuahua, Mexico. The company leads the industry with a global network of more than 100 factory-owned and authorized service centers.